There’s a lonesome stretch of road , called SR 955, which is outside of the bedroom community known as Harborcreek, PA. Not much ever happens along this strech, other than people going from one place to another. Along the one side of the street is railroad tracks belonging to three different owners… Norfolk Southern, CSX, and General Electric, who makes locomotives at Erie and which owns a test track there. Along the other side of the street is not much to speak of… It’s an area that could be used for growing food were someone to take the time. But, nobody has, recently. We happened along this road, in search of a good spot to shoot pictures of the passing parade of trains, and were not disappointed. We did manage to get several photos… but also we got something we hadn’t bargained for. Something to think about on the trip home. You see, we were somewhat taken aback when I noted what looked for all the world a grave stone, along the side of the GE test track. Well obviously curious, I came up for a closer view. What I saw wasn’t related to railroading at all. So what was Trooper McMillen doing here? Just as I started entertaining these thoughts, an older gent driving a battered blue Pickup, with what appeared to be volunteer fireman’s lights all over it, along with communications antennas rolled up, wanting to know if everything was all right. Seeing my camera, he said… “Oh, you’re taking train pictures?” Explaining that yes, that’s all I was after, I asked if we’d done anything wrong. He responded by explaining that no, we were fine, “It’s just that I take care of this place and I was checking to see the lawn wasn’t in need of cutting.” He explained in hushed tones what I already knew… it was a memorial to a State Trooper killed on this spot years ago. Looking closely at the gent, I estimated him to have been retired from the State Police himself. Likely, I thought, someone who knew the Trooper, and was possibly one himself, all those years ago. I thanked him for stopping, and he left, wishing us luck in grabbing pictures. The obvious reverence he held, though, only intensified my curiosity. What would have caused this obviously respected trooper to lose his life on this deserted stretch of highway? One imagines he lost his life while responding to an accident, or while on scene; Officers get hit by passing cars at accident scenes often enough. Those were my thoughts as we traveled back to Rochester, some 150 miles away. What was the trooper like? Was he a vet of many years with the SP’s? A wife, kids and so on. What was it that caused the trooper to lose his life, a year before I was even born? Joseph F. McMillen Joseph F. McMillen was born January 29, 1930, at Conneautville, Crawford County, Pennsylvania. He served in the United States Navy from January 29, 1947, to January 28, 1952. On May 16, 1952, Private McMillen enlisted in the Pennsylvania State Police from West Springfield and was assigned to Troop E-1. He was 22 years old and 5’10” tall. At 9:45 p.m. on May 12, 1956, Private McMillen and Private Paul F. Dell were patroling on Route 955 in Harborcreek Township, five miles east of Erie. A vehicle traveling in the opposite direction, on the wrong side of the highway, struck their vehicle. Private McMillen was taken to Saint Vincent Hospital in Erie where he died of his injuries a few hours later, at 12:47 a.m. on May 13. Private Paul F. Dell was also injured, but recovered. Private McMillen is buried in Glenwood Cemetery, Conneaut, Ohio. He was survived by his wife, Mrs. Audrey M. McMillen, of Cheswick, Pennsylvania. 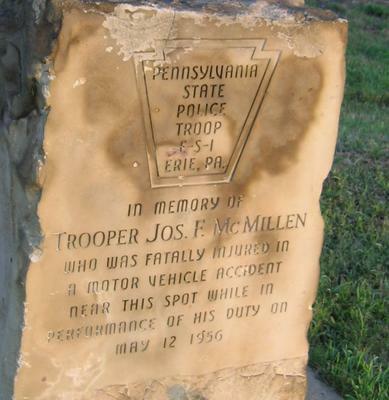 At 26, Private McMillen had completed four years of Pennsylvania State Police service. OK, so maybe it wasn’t as dramatic as all that. Or, at least Trooper McMillen’s passing wasn’t what uninformed imagination made it. Certainly, a sad passing; The trooper had it all ahead of him, did have a wife, and a life I’m willing to bet he held precious as you do yours…but anyone can get killed by a drunk driver, which I assume this case to be. Dirty way to go, though. A raw deal. But clearly, the people of the state thought Trooper McMillen’s passing should not be allowed to go unmarked. And people still keep this a hallowed spot. And I think they’re right. I rather wish I could run into the gent who stopped, so I could tell him that. So he’d understand, that I knew it was far more than simply a nice vantage point for train photos. Barring that happening, however, all I can do is show some respect. So, here’s to you, Trooper McMillen. Your service to us is thus noted with the greatest of respect in this blogger’s space.